was quite revelatory hearing audiac for the first time. sadly, amongst the monolithic weight of musical masses this epiphany was only attained recently through this, their second album. the immediate interest to click their 'listen' button was a certain godly, faustian link with production by hans joachim irmler but i never, truly expected anything quite as dramatic as this! 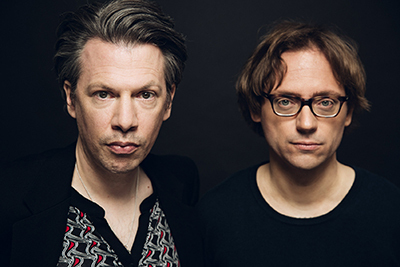 the grandiosity this duo of alexander wiemer van veen and niklas david achieve in their work is nothing short of a total war in sound and the human response to it. the ferocity of gentleness is its first enigma. i guess filing under anti-pop or neu-prog might lead initial steps into the mesmeric waves of piano/keys, detuned (un)formulas and the haunting, glacial soul of alexander's voice. try pushing patrick dineen's wondrous eighties' kan kan pomposity into a blender, decode the shreds and with burroughs-like splicing, rearrange into 23rd century theatre for what might remain of the human race. any wait for noisy atonal kraut barrage is unfulfilled throughout this operatic whole and benefits the weight of irmler's light-hand tethering. when percussion is introduced it's measured and calm allowing voice and atmospherics to soar; choirs full of gospels unreal. so waltz is assuredly unlike any other and with each listen new murmurs appear furthering any thought of musical totality. a remarkable, beguiling joy.